In an agroforestry context, the knowledge of leaf area is an important parameter to take into consideration because tree foliage shades the intercrop. Single leaf measurement (for example leaf length and width) is a widely used method to estimate leaf area in a rapid non-destructive way. In this study, the objectives were to estimate the leaf area of different leaf sizes and shapes for Acacia mangium Willd. (Mimosaceae), Tectona grandis L. (Verbenaceae), Hevea brasiliensis Muell.-Arg. (Euphorbiaceae), and Swietenia macrophylla King. (Meliaceae) Indonesian agroforestry trees. In order to characterise leaf area in field conditions a digital photograph method was used. Leaf length was measured in order to build relationships between leaf length versus actual leaf area. Additional measurements obtained from the digital pictures such as lamina width, number of leaflets, leaflet length and width were recorded in order to test the benefit regarding leaf area estimation based only on the leaf length model. The combination of these different linear leaf measurements led to various degrees of precision of leaf area estimation. The different models can then be chosen according to a compromise between the accuracy of leaf area estimation and the time allocated to field measurements. The authors thank Novi Sari Wahyuni for her help in fieldwork. 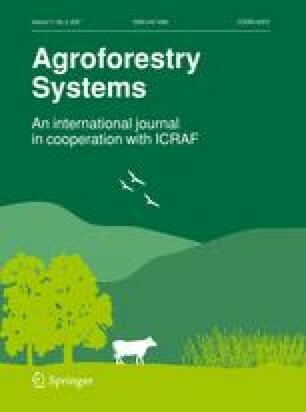 This research was carried out as part of the SAFODS (Smallholder AgroForestry Options for Degraded Soils) collaborative research project, partly funded by the EU: contract number ICA4-CT-2001-10092. AMAP (Botany and Computational Plant Architecture) is a joint research unit which associates CIRAD (UMR51), CNRS (UMR5120), INRA (UMR931), IRD (R123), and Montpellier 2 University (UM27); http://amap.cirad.fr/. The support is gratefully acknowledged.